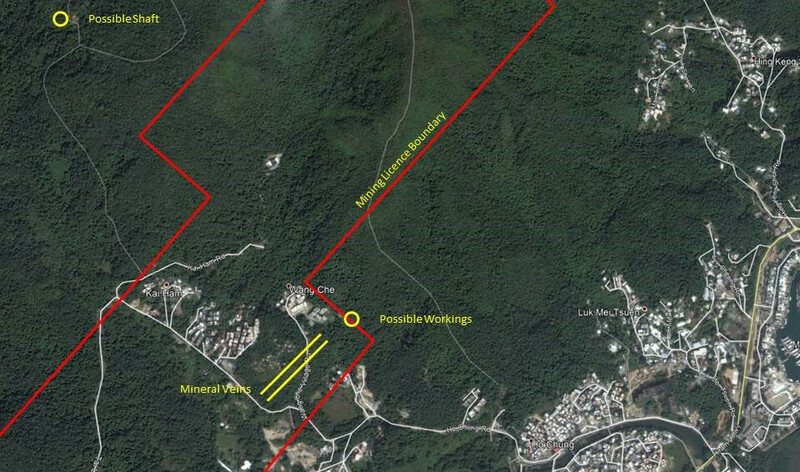 One of the smaller mines in Hong Kong is located at Ho Chung, near Sai Kung, where Wolfram, the ore of Tungsten was exploited in small quantities over many years. The village of Ho Chung was founded around 1550, farming rice in the terraced valley. After the First World War, mining of the ore commenced and continued intermittently until the mid-1950s in the hills above the village. 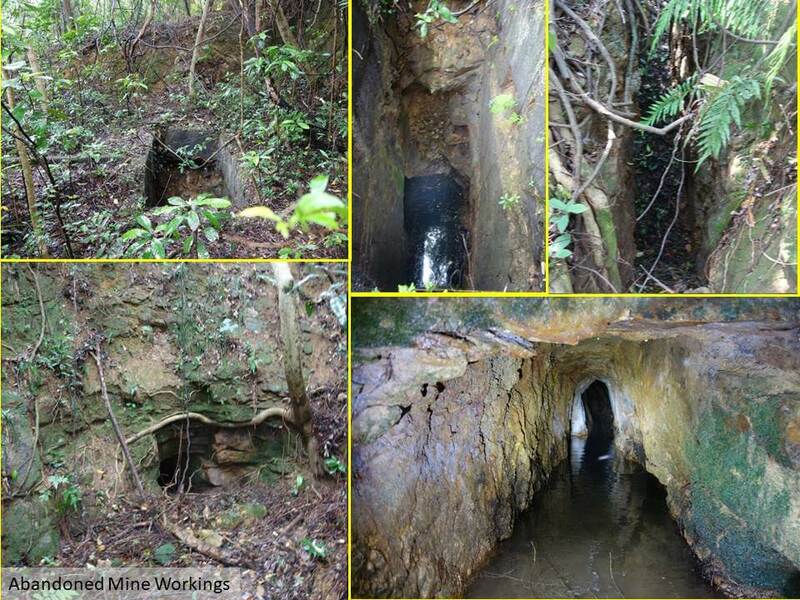 This article describes the abandoned mine workings at Ho Chung. The current condition of the workings is extremely dangerous with unsupported tunnels, shafts and drops. The workings should not be entered. In 1921, an article in the Hong Kong Daily Press noted that six outcrops of tungsten bearing ore were known in the New Territories by the end of 1917, three of which were being developed. These are most likely to have been at; Needle Hill, Castle Peak and Ho Chung. 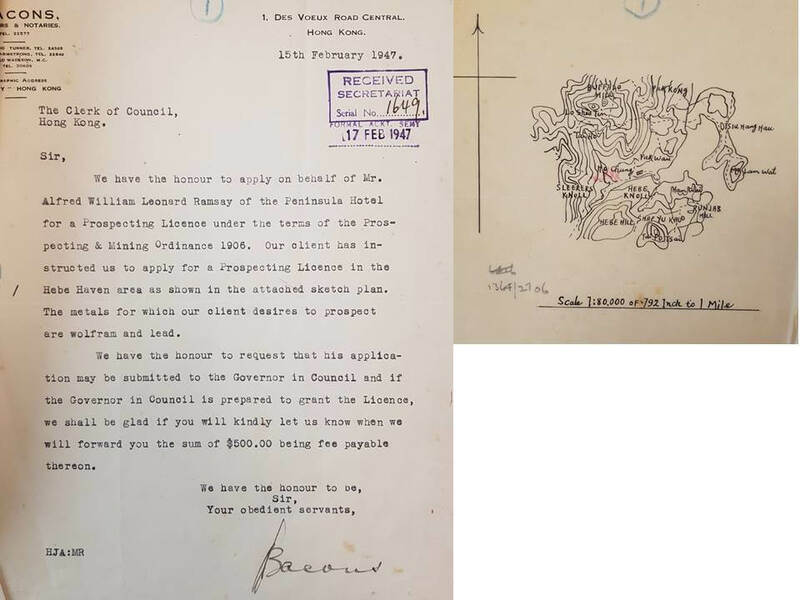 In February, 1947 Deacons Solicitors applied for a Prospecting Licence on behalf of Mr Alfred William Leonard Ramsey of the Peninsula Hotel, for an area around Ho Chung. Mr Ramsey was looking for Wolfram and lead ore.
By March 1948, direction was given and the District Office approved the application with written approval in June, 1948. Mr Ramsey was confident that he could address the villagers’ concerns, but he clearly had little success with finding minerals as on the 29th June, 1951 he returned his prospecting licence. With the rise in Wolfram prices in the early 1950s there was a spike in the interest in mining the Ho Chung area. In early 1951, Mr Che-Mien Hsueh and Mr Tang Hon Fung both applied for permits to commence mining in the area, and they were persuaded by the District Office to make a joint application, which they did on the 26th January, 1951. The two were confident that workable minerals were present they only requested a mining licence to allow them to commence mining without the need for a prospecting licence. The approach of the two men was to spend six months locating the mineral veins with “one hundred or more workmen in digging with picks and shavels [sic] and dynamite when necessary”, and then commence deep mining if the ore was profitable. Details of one of the proponents and the technical proposal are shown below. The term ‘deep mining’ was later explained in a memo from the Superintendent of Mines, “is a means of extracting ore by means of a tunnel, driven into the hillside and then by either continued tunnelling, undercutting, stoping, etc following the veins without breaking to the surface or any way disturbing the overburden”. With the return of the Ramsey licence, in December, 1951 the Superintendent of Mines recommended that the new application be approved as “a considerable amount of illegal mining is taking place on this area at this moment”. The new licensee would bring some order and control to the area. On the 14th January, 1952 the Governor in Council approved Temporary Mining Licence No. 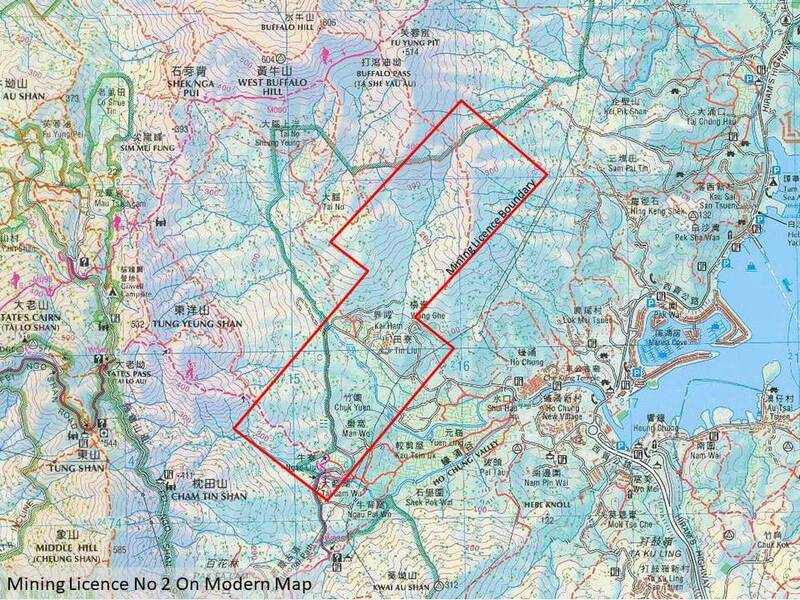 2, commencing 30th January, 1952 for a period of six months for 372 acres of hillside above Ho Chung. The two men then leased the land to the Mining Company, manged by a Mr Sit to extract the ore. The lease was renewed every six months until the summer of 1954 when it would seem it was decided not to renew the lease. The price of Wolfram ore had dropped and small scale mining was no longer competitive, and so the mine was closed. In September, 1951 a request was made for a prospecting licence by Mr Tse Tong and Mr Cheung Hin Wa, two metal dealers. Since the application from Mr Che-Mien Hsueh and Mr Tang Hon Fung was already being processed at the time, their request was denied. Within a few months of starting prospecting, environmental problems became apparent. The Department of Agriculture, Fisheries and Forestry (AFF) were sensitive to the fact that they had not been consulted on the mining licence. The allocated area included a new post war afforestation scheme and was prime agricultural land. 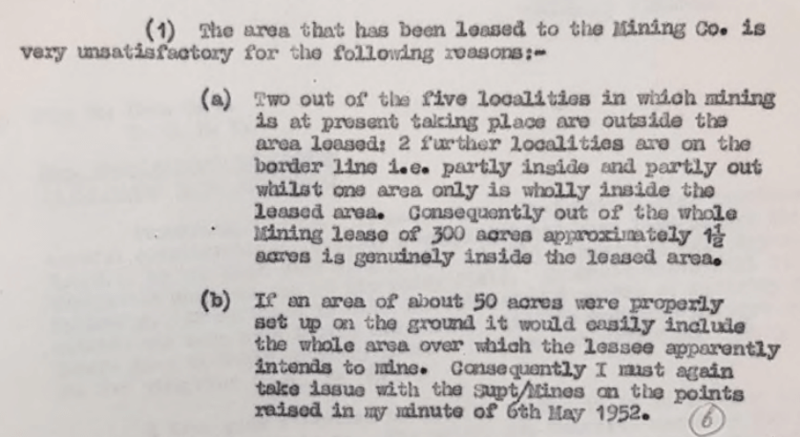 In a memo to the Superintendent of Mines, dated 26th April, 1952 it was recommended that when the lease was renewed it should be restricted to the “immediate vicinity of Wong Tse where workings are at present situated”. 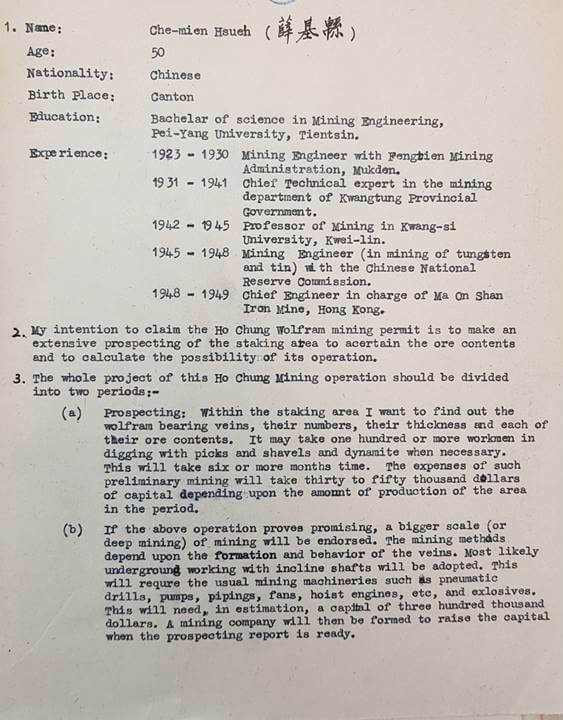 A follow up memo to the Chief Secretary from the Director of AFF on the 28th April, 1952, stated “it was suggested that mining should be prohibited in Hong Kong”, due to the “devastation being done by mining” impacting tourists, beauty and water supplies, in that order. 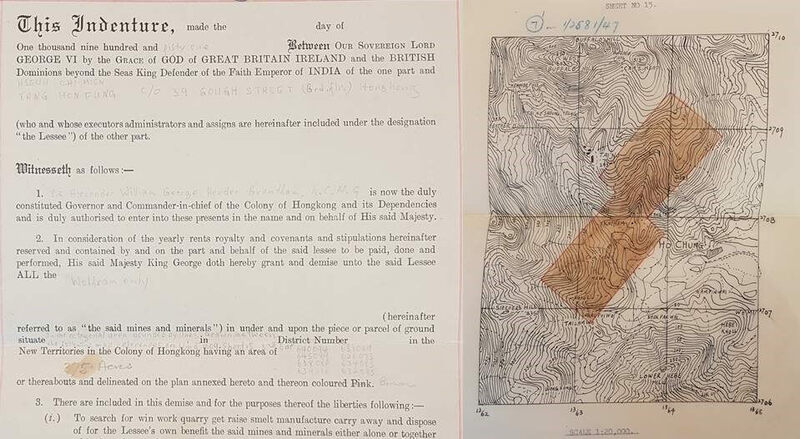 During the early summer of 1952, the Superintendent of Mines; Mr W M Keay, and Mr I P Tamworth, Forestry Officer, exchanged memos on the merits of mining in Hong Kong. The main argument being that licenced miners had to operate within the rules whereas illicit miners caused the problems, i.e. stopping licenced mining would not stop illicit operations. Furthermore, legitimate producers payed a royalty to the Government and “Leakages due to illicit mining are still very large and a big loss in revenue”. On the 11th June, 1952 Mr Tamworth led a raid on the Ho Chung mining operations, arresting a number of miners and charging the foreman with trespass. They had been mining “some 300 yards outside the Licencing Lease 002”. The Magistrate let him off with a warning. Mr Tamworth did note that the mine operator had made a “better attempt than most at deep mining”, that is extracting the mineral ore from underground and not disturbing the surface, as previously undertaken by the illicit miners. Complaints were also received from villagers complaining of silting of irrigation channels and paddy fields along with damage to trees. 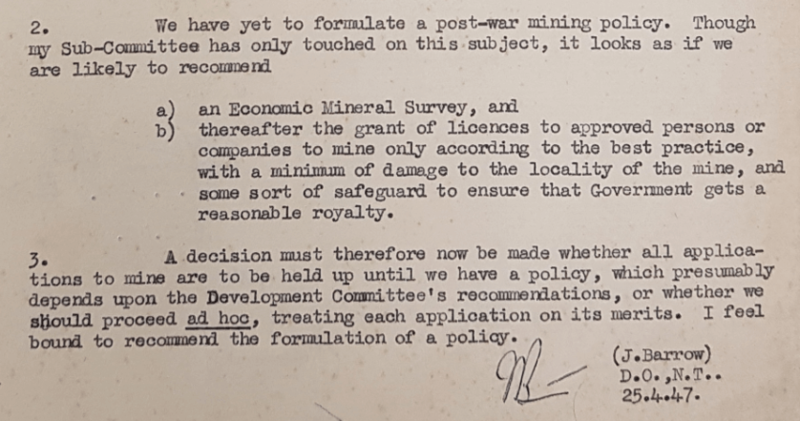 In late June, 1952 Mr Keay responded to the memo noting that the problems of silting and tree damage preceded the current licensee and was a result of the illicit mining works. He was also concerned when the licensee was instructed by forestry officers to fill in old mine workings. As noted by Mr Tamworth, there were five mining locations with only one fully within the licenced area. In 2010, Civil Engineering and Development Department commissioned a territory-wide Light Detection and Ranging (LIDAR) survey by air. Laser beams were used to map the surface of the ground to identify natural terrain hazards. Using this information it is possible to identify where surface mining operations have occurred which would not be noticeable on a detailed topographic map. 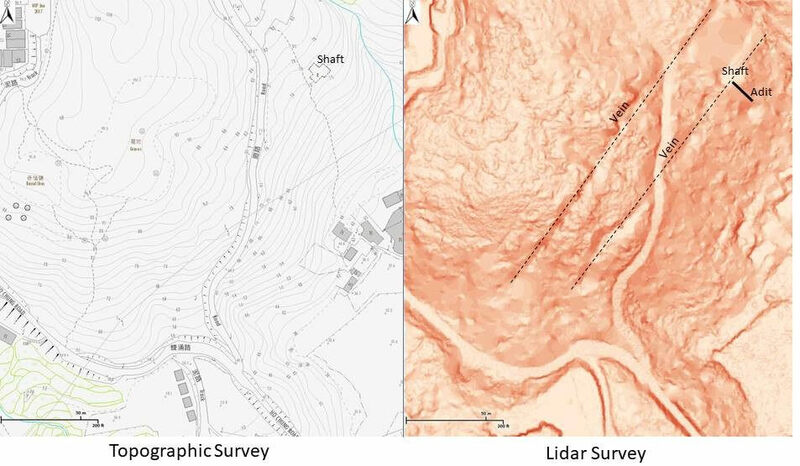 The Lidar survey reveals the old workings along two mineral veins, just below Wang Tse village. On site, these are difficult to find through summer foliage, but if you look carefully, you can see evidence of the illicit workings, the excavated mineral vein and small headings. Below the road are the remains of an old building, access shaft and adit, this would have been the main access into the workings. As for the four sites outside the licence area, little seems to have remained. At the abandoned village of Tai No, just outside the boundary, to the north of the temple is a deep depression, with a number of adjacent smaller depressions. The depression is dry and there appears to be holes descending deeper. This may be an old shaft or a possible collapse above an old mine tunnel. There are also indications of possible workings on the opposite side of the stream below the village. A few years ago, the head of the Ho Chung village was asked about the mining operation. He said that the mining activities were mainly conducted by people from mainland China, and that the local villagers were not involved. He also remarked that there are still the ruins of the miners housing left behind in the hills. The Wolfram ore was exported to the United States for Tungsten production. It is not clear how much was mined at Ho Chung as much of it was illicit, but we can get an insight from some official numbers. The 1953 Hong Kong Annual Report identifies Wolfram production as 313,721 lbs or 142 tonnes of ore. In a paper by S G Davis, he indicates that Needle Hill produced 182,221 lbs in 1953, or 82.6 tonnes. The remaining 60 tonnes being generated by Lantau, Castle Peak, Lin Fa Shan and Ho Chung. 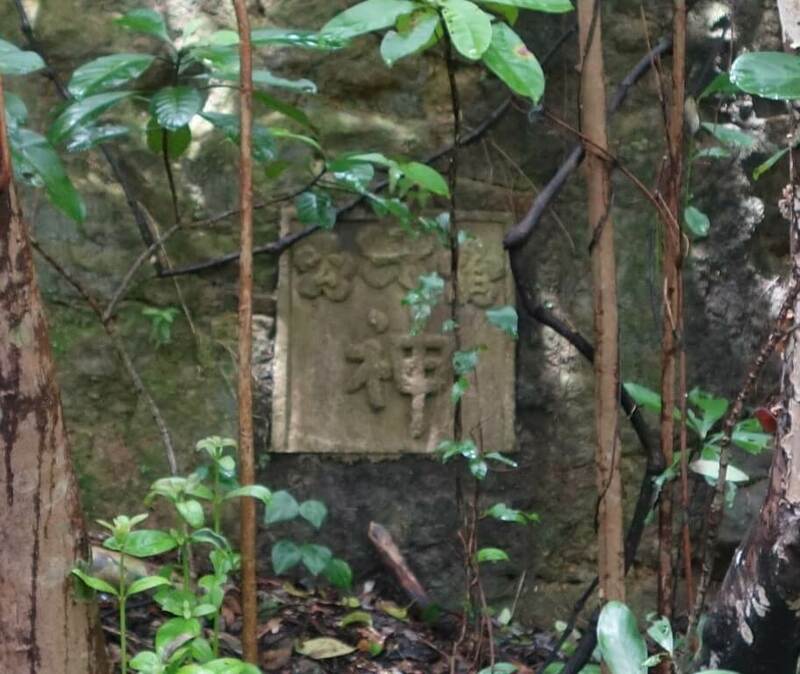 Given that much of Lantau and Lin Fa Shan production was mostly illicit and Castle Peak was small quantities, it is likely that much of the 60 tonnes was from Ho Chung. Adjacent to the shaft is a plaque on the wall with the Chinese word for god or spirit, a request for a safe return for those that venture underground. This article was first posted on 16th September 2017. Marsman Hong Kong (China) Ltd – Needle Hill Tungsten Mine during 1938-1951? Sang Sang Mining Company – connection to Needle Hill Tungsten Mine, 1935?